I've been googling "Audi" a lot the past few days. Not that I'm planning on buying one, (as I mentioned in an earlier post, buying an Audi would show a certain amount of automotive common sense; something I don't have yet) but to look up some info for an acquaintance who already owns one. 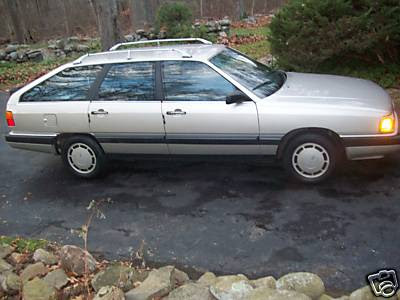 During one of my searches I stumbled on a 22,000 mile 1984 5000 wagon on eBay. When Audi introduced the 5000 in the US it became an overnight sensation. Great looks, superior aerodynamics and the available Quattro system placed at the forefront of German imports. Unfortunately, the 5000 also almost destroyed Audi in the US as false reports of unintended acceleration made headlines and killed sales. Audi, to their credit, hung in and has since introduced the spectacular A4, A6 and A8 lines. Older Audis have not become collector's items (the exception being the UR Quattro which is just now getting some attention in the collector's market). Chances are they never will. If you buy this car, buy it to drive it. It's about as close as you'll get to buying a brand new 1984 Audi in 2008. Click here to see the eBay listing for this 1984 Audi.